It's been a tough year for traders and bankers alike, as layoffs have gripped firms due to difficult trading environments and an overall sluggish economy. However, there is one area that is starting to actually pick up. As the number of bankruptcies begin to increase, firms are expanding their turnaround teams in order to handle all of the work headed their way - bankers with experience in turnarounds and restructuring are now in high demand. "Firms are hungry for experienced restructuring professionals, who are increasingly in short supply. You need to reach deep into your Rolodex to find people you know who are capable, and you need to move fast." said Richard Shinder, hired by Piper Jaffray in March to help build out its restructuring team. 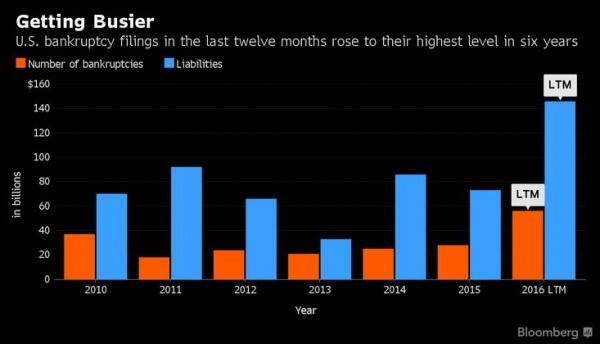 Both the number of bankruptcies and the amount of liabilities associated with them have picked up significantly, as Bloomberg points out. 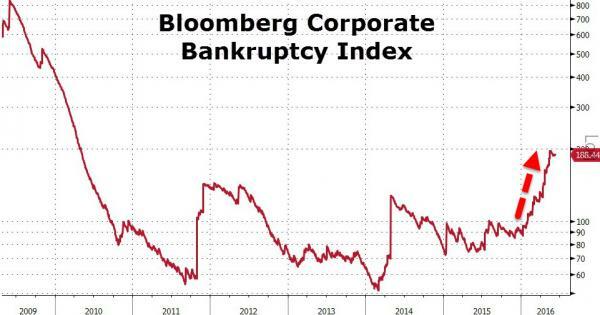 With the amount of companies in distress, firms such as Lazard, Guggenheim Partners, Perella Weinberg Partners and AlixPartners are all hiring in anticipation of even more bankruptcies. "Cycles come and go, but when a wave hits, you want to make sure you are in the right seat with the right group of people. We are putting the band back together." said Ronen Bojmel, who is helping to build the restructuring team at Guggenheim. Moody's is forecasting high default rates in sectors that are largely expected given commodity prices, such as Metals & Mining and Oil & Gas, however trouble looks to be spilling over into other sectors such as Construction, Media, Durable Consumer Goods, and even Retail. As we have discussed for quite some time, central banks in their infinite wisdom have made the cost of money so cheap that it has created an environment that forces a complete misallocation of capital in the market as the search for yield continues down every rabbit hole it can find. This will (and already is) inevitably catch up to the economy in the form of defaults and bankruptcies. "The wave is already here. Many risky debt deals have been done as people chased yield, and it's a matter of time before many of them blow up." said Tim Coleman, head of PJT Partners. Business is booming for firms such as Guggenheim and Lazard, which implicitly means very bad news for the rest of the economy. Guggenheim has one of the fastest-growing turnaround teams, with 11 senior advisers brought on in less than three years. Projects include advising satellite operator Intelsat SA, which has more than $15 billion of debt. For Lazard, the largest independent merger adviser, restructuring advisory revenue jumped 84 percent to $42.6 million in the first three months of this year from the same period last year, according to filings. Its work included negotiating turnaround plans for Vantage Drilling, an oil-and-gas company that sought bankruptcy protection in December, and Walter Energy Inc., a coal producer that filed last summer. "Restructuring advisers have been busy moving to different firms lately. That shows a growing conviction that the next cycle is upon us and there is a desire to be in the right seat when the music stops. And if you're really lucky, among friends you know and trust." Said Guggenheim's Durc Savini. The right seat when the music stops, that sounds like something tin foil hat wearing irrelevant bloggers would say. At any rate, with the corporate bankruptcy index surging, and firms scrambling to bolster restructuring teams, we recommend that everyone remain acutely aware of these developments.